Welcome to our visitors' journal, a collection of memorable moments, comments and insights from visitors about whatever made their trip to Barbados one to remember and cherish. We would love to hear about your experiences and memories, so please send us an e-mail or get in touch via social media and your comments will be added to this growing collection of Memorable Moments! My husband and I have just returned from a glorious weeks holiday. The thing that strikes me most is the friendliness of the people. They really are quite unique and are what make me want to return to the island again and again. I would recommend it to anyone! 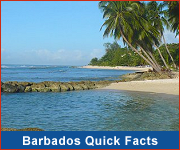 I am now telling all of my friends and associates "I have seen Paradise and it is BARBADOS!". The genuine warmth and hospitality of the Bajan people has left a lasting impression on us. An Awesome Trip To Barbados! Hi! I visited Barbados last year in April and it was the most beautiful place that I have ever been to. The best thing that I did besides lay on the beach was take a submarine ride. It was an awesome experience. We even saw a rare sea turtle. The people in Barbados are among the friendliest in the world. I also enjoyed taking a ride on a catamaran for the day...complete with a champagne breakfast. Totally awesome! If you want to get up close and personal with the Barbados Green Monkey, go to the Barbados Wildlife Reserve at feeding time. The children loved it, it was a topic of talk for days and we all still remember whenever we think of holidays. Hey !! I saw Pavarotti performing at Holder Hill in Barbados. I was sitting on a rug with my picnic basket and my sparkling wine and lovely company. Sitting under the stars on the wide open polo field. Imagine it !. There were shooting stars in the sky that night and he sang loud and strong across the field and to the sky. It was magical. Just beyond your Imagination !